There’s nothing unusual about a cold, wet evening in Manchester, you might think. But tonight was a little different. 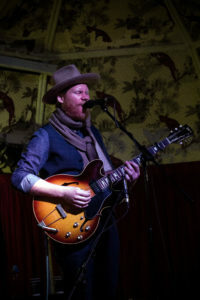 Tonight Jarrod Dickenson, the much travelled Texan troubadour, brought his current UK tour to the city for a wonderful evening of songs and stories. First up we were treated to 2 support acts. Opening the evening was Demi Marriner. The hall was still steadily filling while she was on, but those who were there were rewarded with a fine set of self-penned songs such as “Stay”, “Don’t Worry” and “Sins”. She has a lovely voice, and a confident and gregarious manner that allows her personality to make an impression too – no standing timidly at the mic here. She’s clearly one very talented lady. She certainly made an impression on me, I’ll definitely be keeping my eyes and ears open for her. Her music is available through her own web site, check her out. Next up was JP Ruggieri, a regular collaborator and contributor to Jarrod Dickenson’s studio and live work. He showed he’s more than a sideman though. He plays a really nice guitar groove and couples that with the slightly playful delivery of his tenor voice. I don’t know why, but I find myself smiling when I listen to JP’s music – regardless of the lyrical content! It just has that kind of sunny feel to it. Jarrod’s wife Claire brought her gifts to JP’s set too. She’s a talent herself and her contributions added an extra layer to JP’s material. He’s has recently released an album of his own, available at the usual streaming sites. It’s well worth a listen. I thought both the support acts were excellent in their own right, but they also stood up well as part of the evening as a whole. Sometimes a support act can clash a little with the headliner in terms of tone or style, but this wasn’t one of those times. 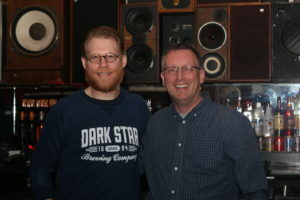 Both Demi and JP contrasted and complemented Jarrod’s own set, and contributed to an excellent evening of live music. Ultimately, of course, tonight is about the headliner. Jarrod climbed onto the stage, accompanied by the returning JP and Claire, and was straight into “The Northern Sea”, the haunting tale of a deep sea fisherman fighting for life and livelihood. It’s a great opener that sets the stall out wonderfully well. 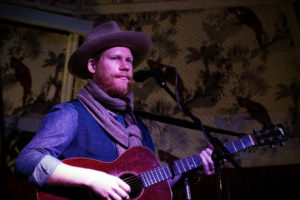 His song-writing weaves vivid characters such as this into rich narrative, and his arrangements provide the setting for it all to come to life. You can almost taste the salt water when this one is playing. Much of the rest of the evening is taken with tracks from his most recent album, the excellent “Ready the Horses”. Wonderful songs like “Take It From Me”, “In The Meantime” and “Nothing More”. There’s no full band tonight so the sound is a little more stripped than you might be used to, but great songs are great songs come what may. Jarrod lays the foundations on guitar, JP on pedal steel and electric guitar adding accents and highlights to the mix, and Claire providing a variety of percussion as well as her voice. The venue holds around 250-300 people, and everyone is listening. I meaneveryone,and I mean listening.Idon’t think I’ve ever been to a gig where the audience are so quiet during the performance. There’s clapping and cheering aplenty all evening, of course, but only between the songs – not over them. It’s not just a respect thing. The crowd know why they’re here, and they want to hear everything. Jarrod has a new EP out soon, “Under A Texas Sky”, featuring covers of songs by musicians who hail from the Lone Star State. He featured 2 songs from the EP this evening. The first, a stirring version of Roy Orbison’s bluesy “Uptown”, really hits the spot with its steady, driving beat, and Claire’s supporting vocals providing extra texture. The second EP track to feature is the wonderful “Dublin Blues” from Guy Clark. There’s really not much more I can say about it. Both the song and the performance are just that – wonderful. There are three other songs on the EP, take my advice and check it out – then maybe delve a little deeper into the back catalogues of the featured artists, too. I think you’ll find it worth the effort. Jarrod’s honeyed voice is certainly all his own, but there’s also a familiarity to it; familiar, like a warm woollen blanket on a cold day. You can feel the fibres in it, you know it’s entirely natural, and straight away you just know that whatever else is going on, life is somehow better for having it with you. He has such a relaxed vocal style that he uses so perfectly for his songs. There’s no straining, no exaggerated dramatic affectation is required. The lyric, the melody and the arrangements have all the drama each song requires, so well-crafted are they, and there’s no need to force anything. Something else I noticed during the evening; when Claire and Jarrod sing together there are moments when it comes across more like a harmonious chord from a single instrument, rather than a meeting of two distinct voices. It really is quite magical to hear moments like that, in a smaller venue such as this. Great times, great memories. Before Jarrod eventually closed his set with “Goodbye”, alone now on the stage, he spoke to the hushed and attentive audience about his grandparents. They’ve clearly been huge figures in his life, and I’m sure he’s feeling the recent loss of his grandfather very keenly. It would be easy for a song in tribute to someone like that to be perhaps a little over sentimental, possibly even a little maudlin, and forgivably so. However, if there’s one thing we know for sure, it’s that Jarrod Dickenson knows how to write a song. So instead, he finds something he can share with us that is affectionate, romantic and genuinely touching. I don’t know how he does it, but I’m glad he does, and it was a lovely way to draw the evening to its end. As I left the venue and stepped back out into that cold, wet Manchester night, I couldn’t help but notice that it somehow felt a little less chill, a little less damp; maybe a little less dark, even. There’s magic there. Keep bringing it, Jarrod. Thank you. 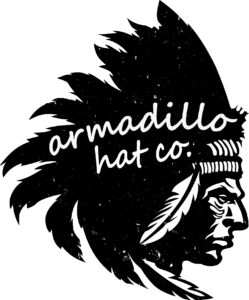 Check out our interview with Jarrod before the show here.